In 1956, the Communist dictator of China, Mao Zedong, launched what was called the Hundred Flowers Campaign. This was a response to dissent from intellectuals and artists in China who felt marginalized by the rigors of Communist rule and doctrinaire ideology beginning with the takeover of China by the Communists in 1949. Mao gave the appearance of appeasing the intellectuals. Mao declared, “The policy of letting a hundred flowers bloom and a hundred schools of thought contend is designed to promote the flourishing of the arts and the progress of science.” Intellectuals and artists responded with new writings and modes of expression, much of them critical of the regime. But the campaign was a trap. Once the intellectuals and artists expressed themselves, they were easily identified, rounded up by the secret police and sent to re-education camps or in some cases tortured or killed. This reaction and repression in 1957–59 was known as the “Anti-Rightist Campaign.” Something similar seems to have happened in cryptocurrencies in China as detailed in this article. From 2012–16, China was extremely friendly to cryptocurrencies. Chinese subsidized electricity rates (in part by burning coal and polluting the air), which encouraged a large bitcoin mining community. Then Chinese citizens began using cryptos to get their money out of China and evade capital controls. Cryptocurrency exchanges flourished in China, and Chinese citizens were among the most active traders and investors in cryptos. 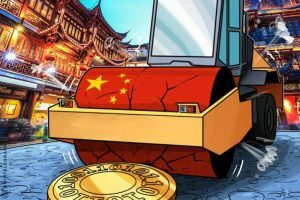 Finally, numerous Chinese startups launched initial coin offerings (ICOs) to finance their activities. In short, China let a hundred cryptos bloom. Now that China has mastered crypto technology and created crypto infrastructure, a repression has begun. It’s a kind of “Anti-Crypto Campaign” similar to 1957. ICOs are banned, mining operations are being shut down and crypto exchanges are being closed. Instead of a hundred cryptos, the government will allow only one cryptocurrency in the future, which will be controlled tightly by the People’s Bank of China. Chinese history is full of pendulum swings from centralization to decentralization and from liberalization to repression. Right now repression of cryptos in China is the order of things as dictated by the Communist Party.